This is the ninth painting in my Copper Pot series. I work from photographs I have taken myself. When tackling a painting like this, I rely on the composition that I created using my camera. Then I break it up into small manageable areas which I mentally turn into abstract sections. I then approach each area as a non-objective "piece of the puzzle", dealing with color and value rather than subject. Masking tape is used to protect unpainted sections that I want to deal with later. Because of the photo, I know where I am going, it's just a matter of getting there. 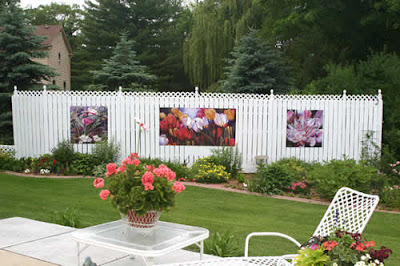 In 2006, I was called by a lady in Evansville, asking if I could help her disguise an ugly fence. And here's what it looked like when we were finished. Go here to learn more about the project and the artists involved. In 2008, I went to Main for a workshop with Donna Zagotta. I created a slide show of some of the things that I accomplished as well as a scrapbook of the week. I posted it on line back in September but I thought it would be a good addition to my blog. So even though it is a little out of date, please enjoy it. Click here for slide show. I mentioned in a previous post that I was starting to hand paint some of the etchings I had done a few years back. One was "gold leafed" and seen in a previous post. The one below is my first hand coloring job. Fun and mind relaxing. 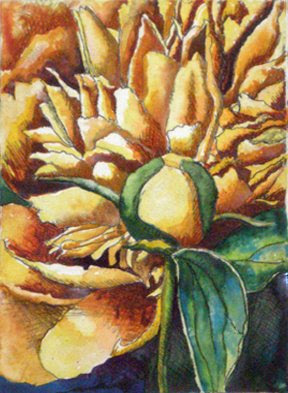 This yellow one is small, 4 x 6. 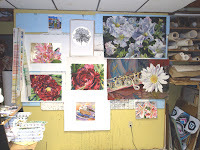 I'm planning to go to Hobby Lobby and get some nice frames to pop these into, ready for the Spring Art Tour. I'll post various versions of this same etching when I finish them. The following painting is done on arches hot press using watercolor and guache. 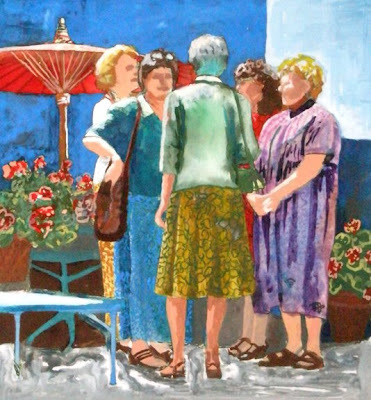 I am playing around with figures and opaque w/c after taking a class with Donna Zagotta. I picked up a fancy frame, gold leaf, at Hobby Lobby, $20 with glass and gold leaf moulding, size 12 x 40... which makes for an interesting format. Here's where I went with it. I really look forward to seeing it framed up. So here's what I'm doing. 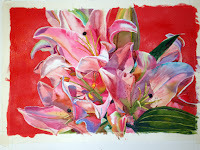 It is a variation on a demo that I've done before with yupo and arches rough paper. I have drawn out the same image on yupo, arches rough, claycoated panel (box) and the clear paintable mylar. I also have an etching of the same image on reeves bfk and I did go ahead and do a drawing on arches hot press, which I hate (not the drawing, but the paper). Below is my work table with the various versions spread out. The arches rough and the yupo are well on their way, the others have a way to go. This is the design that I have been working with for all of these images. 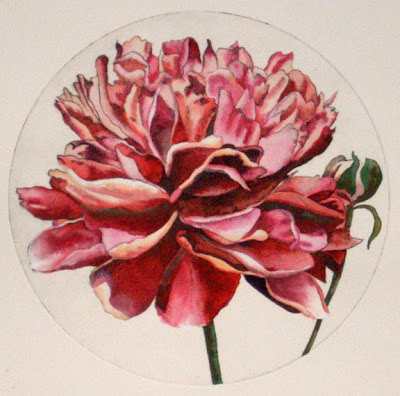 It was to have been a medallion which is why I distilled the drawing to simply black and white. Unfortunately, it never happened, but I have made good use of the drawing. 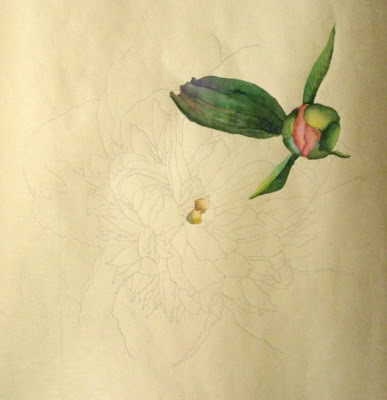 Below, this is the start of the image on the paintable mylar. It is less slippery than yupo. Below is the cradled clayboard box. The surface is toothy. I like it a lot. This is the etching with the painting started. The paper is very soft. the ink has been pressed into the paper, causing a semi-resistant surface. 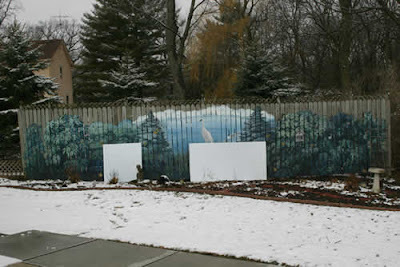 But it allows a nice rich painting surface, even so. Here is the yupo, of course. 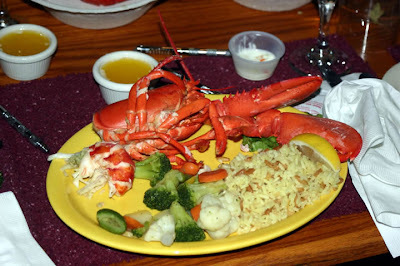 Nice and juicy. Later, I will add the arches hot press. I have it drawn out and will bring it up to speed with the others. Susan Webb Tregay gets credit for the title of the demonstration, "Striking Strokes - Shifting Surfaces". Here's what it looks like now. 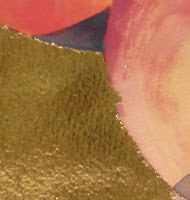 I planned to come in with some acrylic to glaze over the gold leaf to put the dimension and form back into the fabrics. Probably not worth it with the messy edges but well worth the experimentation. I then prepared the following painting for gold leaf by painting the background cadmium red medium as an undercolor for the gold. I really liked the red and thought about stopping, but no.... my intent was gold leaf so gold leaf it is. I used a friend's method of putting down a mask with contact paper but did use adhesive. I really am happy with how it turned out but you will have to wait to see it since I haven't photographed it. Here it is in the pre-goldleaf stage. I did go ahead and leaf the lillies, just 'cause. (I know... you can't guild the lilly!) The comments on New Year's eve were that the gold didn't work all that well on this particular piece. The execution was fine but the contrast was difficult. I think it's neat, though. and I'm glad I did it. 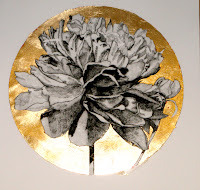 The next challenge to to learn how to photograph gold leaf. I did these fast just to get them up on the blog. Here's the lillies with the gold leaf. I think it is very rich and elegant. I burnished it a lot but not so much that I flattened out the rough texture that is in the paper. it accomodates the leaf nicely. This is an etching I did a while back. The mask kind of wanted to pull up the etching paper but by carefully lifting it, all was well. The gold isn't as garish as it looks here, actually it is quite nice. Lee Weiss was quite taken by it on New Years. Liked it better that the lillies, above. So here's another experiment with a 20+ year old painting. I tried silver leaf which is thinner than gold. You breathe... it moves. The medium that Judy recommended dried faster than I expected. Mostly because I forgot to cut it with water... my fault. So the silver stuck in some places and not in the other. interesting but I'd never show it. then i came into the upper right hand corner to see the difference between actual leaf and acrylic metallic silver paint. Wow, what a difference. The paint is dead and totally unbelievable next to the real leaf. Did you know that you can double click on the pictures for bigger versions? Give it a try. Finally, here's a picture of my studio wall as I displayed it with recent and not so recent works to show folks who visited on New Year's eve.